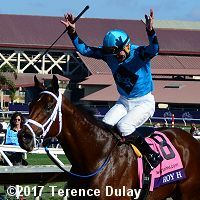 Jockey Kent Desormeaux celebrates as Roy H returns after the Sprint. 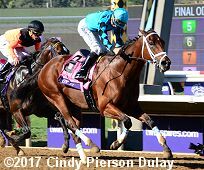 A field of 10 older horses went to post in the $1.5 million TwinSpires Breeders' Cup Sprint (G1), a 6 furlong trip around one turn of the main track. Defending champion Drefong was sent off as the 7-5 favorite off his win in the Forego (G1). 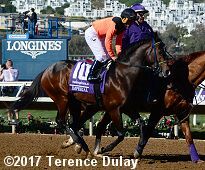 In to challenge him included 4-1 second choice Imperial Hint, winner of the Smile Sprint (G3) and Donald LeVine Memorial, and 5-1 Roy H, winner of the Santa Anita Sprint Championship (G1). 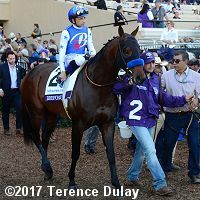 8-1 Takaful was quickest away through a quarter in 21.82 before Imperial Hint took over through a half in 44.61 while pressed by Roy H. Imperial Hint led to mid-stretch through 5f in 56.56 but Roy H and jockey Kent Desormeaux outfinished him late to win by a length in 1:08.61. 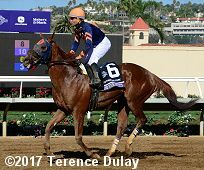 It was another 2 lengths back to 9-1 Mind Your Biscuits third, while Drefong was 6th. Left: Roy H heads to the winner's circle. 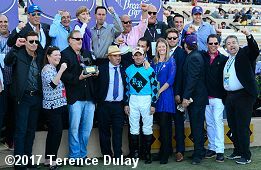 Winning jockey Kent Desormeaux said, "He had to man-up the first 200 yards. I had to jockey for position, fighting for a spot two times in 200 yards. After that, he had the catbird seat. He raced off my fingertips and gave me a lovely ride. Absolutely exploded turning for home. He was full of run. We were running from the quarter pole to the eighth pole. We took off. I mean we exploded and couldn't catch the leader for at least 200 yards. Once Roy gained the ascendency, he steadily opened up. I looked at the Jumbotron and the next guys were five behind us, so I was safe with the win." Right: The trophy presentation for the Sprint. 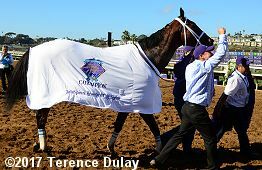 Winning trainer Peter Miller said, "This is amazing. Two Breeders' Cup wins in one day. The race shaped up the way we thought it would. We saw a lot of speed in there and we figured he could sit third or fourth and make his big run. He did it just the way we drew it up. I fel like Chad Brown, I feel like Bob Baffert, one of those guys. " Left: Roy H in the post parade. Right: Roy H heads back to the barn after the race. Miller added, "Anyone that asked me about my horses today, I said they're all live. Use them all, and I meant it. It's rare that they all show up like that but we got great rides and great luck!" Left: Second place finisher Imperial Hint in the post parade. 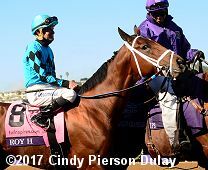 Jockey Javier Castellano said, "I'm not disappointed in the way he ran at all. He ran a great race. He kept running all the way to the end. He just got beat." Trainer Luis Carvajal Jr. added, "He came so close. He ran great. it was a great race, and it was a very tough race. I am so proud of my horse." Right: Third place finisher Mind Your Biscuits returns after the race. He was also third in this race last year. Trainer Chad Summers said, "We were concerned when we came here that the stretch was short. It got to us today. We were a little bit further back than I was hoping. I wanted to be a little bit closer and be in it a little bit earlier. But he came with his run like he always does. We knew the Forego was a bit of a fluke. I think he showed up today and made us proud. 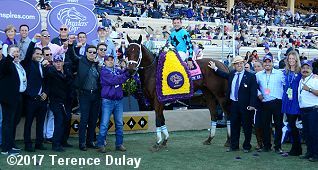 We're disappointed but there's always next year and the Breeders' Cup at Churchill with a little bit longer stretch." Sixth place finisher and beaten favorite Drefong heads out to the track before the race. Trainer Bob Baffert said, "I knew in the first 100 yards it was over when he couldn't make the lead. What I was afraid would happen, happened. He's been good to us and I really can't complain. I knew the inside post would be tough on him and I could tell when he went across the gap there that Mike (Smith) was a little hesitant with him. You need racing luck. You need a good horse, but you need racing luck. It wasn't his day. This horse doesn't owe us anything. He's been great to us. I can't complain."